Our purpose is to check, educate and adjust as many families as possible towards optimal health through gentle, accurate, corrective care. Our team is dedicated to helping you regain your full health potential and assisting you and your family to stay well for life. Furthermore, we are equally committed to continuing to educate the broader community about the vital role that their spine and nervous system play in the quality of their lives. Through our systematic educational programs, we empower and support our patient members with both knowledge and tools to regain a level of optimal health and vitality they have not previously experienced. Whilst people start chiropractic care for many different reasons, our primary goal is not simply to alleviate your pain or symptoms. Instead, we strive to ensure that your nervous system, which can be likened to a “communication superhighway”, is able to relay information back and forth between your body and brain. This is of vital importance because your nervous system, which is housed within the spine, controls and regulates all of your body. Your communication superhighway, or your nervous system, coordinates and controls every function in your body through vital nerve messages and is responsible for healing, repair and regeneration in your body. Your current level of health can be the result of the quality and quantity of your nerve messages. When you have a healthy nerve system, you are better able to handle the challenges of life because you are able to adapt, heal and recover at your optimal best! 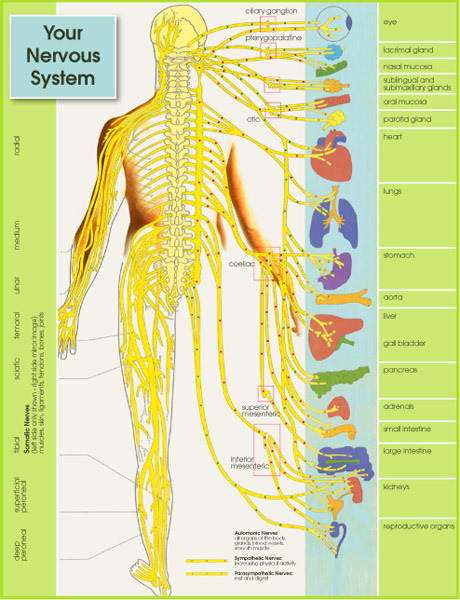 Only 10% of your entire nerve system carries or perceives pain. Up to 90% can be heavily stressed without any alarms, whistles or warning bells. Your Posture is the Window to your Spine and Health. Your spine is the most important factor affecting your posture. In order to have the best possible posture (and health), your spine has to be in the best possible condition. From the rear your spine should be perfectly straight ( figure 1). From the side you should see three curves, each having a 60º arc (figure 2). Science, anatomy, and physics all observe that a 60º arc offers the strongest defence against the destructive forces of gravity and movement. We take our role as your primary health and wellness team very seriously and advocate lifetime care of the spine and nerve system. We have a phenomenal move well, eat well, heal well and be well program that will teach you everything you need to know to get maximum results from your care. Our doctor graduated with a science degree from Adelaide University with a double major in anatomy and a masters of Chiropractic from Macquarie University.